At the Association's 2009 meeting, members proposed compiling and publishing a book, similar to one that had been produced by the United Methodist Committee on Deaf and Hard-of-Hearing Ministries, dealing with various aspects of life as a minister with a disability. An article in the Disability Blog about professionals with disabilities produced further interest. Articles in the press about clergy burnout, such as Paul Vitello, "Taking a Break From the Lord's Work," (New York Times, August 1, 2010), helped generate interest in the project, as well as broadening the effort to include a variety of conditions. After three years of work, the result was published in April 2012. One Episcopal and 23 United Methodist ordained and lay ministers join Bishop Peggy A. Johnson, assigned to the Philadelphia Area in the Northeastern Jurisdictional Conference of the United Methodist church, in relating their sometimes heartwarming, other times heartbreaking stories told in Speaking Out: Gifts of Ministering Undeterred by Disabilities. The book is available for $19.95 from Amazon.com, Barnes and Noble bookstores, some small business booksellers, and in public libraries that choose to purchase it. Edited by Robert L. Walker, the book unveils many facets of coping with incurable injuries, accidents at birth, physical or mental illnesses, and genetic disorders. Blindness, deafness, ambulatory challenges, brain injuries, and specific illnesses are discussed. Several of the contributors divulge their personal experiences of discrimination by church members and leaders who harbor prejudices. Above all else, the book tells of the importance of demolishing physical and attitudinal barriers that prevent both a full acceptance of ministers with disabilities and a willingness to make churches, parsonages, and other facilities wholly accessible. Further, each of the 25 writers is a living testimony that will surprise, inspire, and remind readers that all of them have God given gifts and were spiritually strengthened during their individual life-journeys, all the while remaining faithful to their respective calls to church ministry. Speaking Out focuses on clergypersons, but each story is applicable to lay persons living with disabilities of every kind that call for a modern replay of the Jesus-led disavowing of the sacred and secular discriminations against physically or mentally challenged people. It is to that end that every reader is invited to understand and internalize each author's challenging, yet undeterred journey to a truly communal humankind. Gracing the book's cover and the inside title page is "Circle Dance," a painting by Donna Fado Ivery who is one of the 25 authors. The Introduction was provided by Tim Vermande, likewise an author of a chapter. The Foreword was written by Kathy Black, Ph.D., the Gerald Kennedy Professor of Homiletics and Liturgics at the Claremont School of Theology in Southern California, and author of A Healing Homiletic. 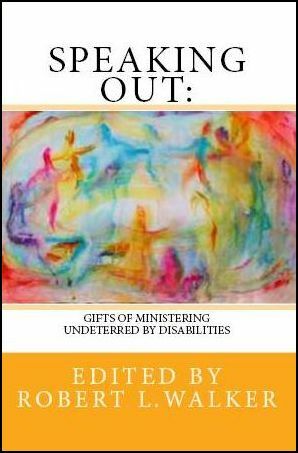 Sponsoring the book is the United Methodist Association of Ministers with Disabilities (UMAMD), and all royalties will go to that organization in support of its activities. The book comes in two forms, one being a paperback item and the other a Kindle digital format; the digitalized form is ideal for people who have low or no eyesight, and for anyone who cannot hold a book or turn its pages. Managing the book's progress was an ad hoc committee composed of Bishop Johnson, Tim Vermande and Robert Walker. Evelyn McDonald and Eric Pridmore, co-chairpersons of UMAMD, provided policy oversight. Formatting the book and arranging for its respective production by the CreateStage and Kindle publishers was Leo Yates who has written two books on interpreting religious language through American Sign Language (ASL), benefitting Deaf people. A third book was written with Bishop Johnson, giving the history of the United Methodist Christ Church of the Deaf in Baltimore, MD, where each had formerly served as its pastor. The books are available through Amazon.com as a paperback as well for the Kindle Reader. If you don't have a Kindle, you can download a free Kindle Reader for PC, Mac, several tablets and phones here.